By Matt Reimann. Nov 1, 2015. 9:00 AM. Creating a good children’s book is hard, creating one that endures for half a century is even harder. Yet that’s exactly what Hilary Knight and Kay Thompson did with the creation of their famous character, Eloise. For sixty years, the exuberant six year old has captivated generations of fans in a way few children’s books ever do. There should be magic in every children's book, and Eloise's magic comes from her sheer relatability. So many people see themselves in the character's enduring weirdness and audacity. In the end, it is doubtful this would have ever happened were it not for the personality of her illustrator, Hilary Knight. Hilary Knight’s parents were both illustrators by trade: his father a technical one who often dealt in subjects of aviation; and his mother a fanciful one who instilled in Hilary a sense of wonder. Their influence on him was clear from the beginning. Hilary always knew he was going to be an artist. He even keeps his own favorites of his parents' drawings on display in his home, including one by his mother from the '30s that inspired the design of Eloise. In the 1950s, the 29 year-old Knight was introduced to Kay Thompson, an accomplished singer and entertainer. Thompson had played around with a character for some time, calling her friends occasionally over the telephone as “Eloise,” a precocious, independent child who lived in the Plaza Hotel. Knight, she agreed, was just the person to bring her to life. It was easy to be overwhelmed by Thompson. Almost twenty years Knight’s senior, the children’s book was just another venture for the singer and moviestar. For Knight, it was his big break, finally taking him out of the world of piecemeal magazine gigs. Because he was an amateur, Knight’s contract gave him virtually no legal claim to the rights to the character that was half his creation. It would prove to be a moment that would haunt him to this day. Hilary Knight is no plain man. The flamboyant septuagenarian has his many quirks. He makes miniature tombstones for the rodents his pet cats happen to kill. He films constantly on a hand-held camera, recording footage of his guests and himself in various costumes. Still, Knight remembers feeling dwarfed by the massive personality of Thompson, who demanded and succeeded brilliantly at commanding the attention a room. 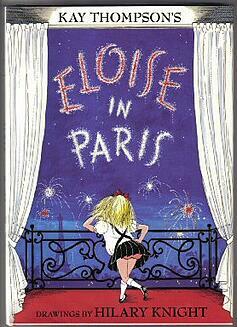 The first Eloise book was published in 1955, subtitled A Book for Precocious Grown-ups. Success demanded that it be adapted for children, as it was in 1969. The pair published three more Eloise books in Thompson’s lifetime, but not without a good deal of personal and professional tension. As the pair continued to work, they became less yielding, each demanding that their vision prevailed. What started splendidly as a collaboration descended into a battle of stubborn personalities. After their worst days, Thompson would ruin whatever Knight had accomplished, defacing his illustrations with rubber cement. Finally, the pair was working together in Knight’s New York apartment. As Hilary was drawing, Kay reached her hand over his, to make it more to her liking. It was the last they ever saw each other. Thompson went on to ignore Knight’s telephone calls until her death in 1998. Soon after, there was a feeling that with the rights to Eloise now out of Thompson’s hands, the endearing toddler would enjoy a renaissance. Knight went on to resurrecting the pair’s aborted last effort, Eloise Takes a Bawth. The book did get published in 2002, but not without ire and conflict from the estate. Disagreements between Knight and the rights holders have thwarted further volumes, but Hilary still looks forward to the day when he can continue Eloise’s story properly. 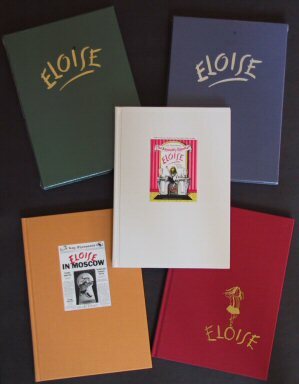 Eloise, whose sixtieth anniversary comes this month, is as endearing as ever. Countless girls hold the character dearly as an inspiration of strength and independence, while parents tout her as a formidable role model. With a documentary profile on HBO earlier this year, entitled It’s Me, Hilary: The Man Who Drew Eloise, we gained an illuminating look at one of children’s literature’s great living treasures. A glance at Hilary Knight shows a life well-lived, but that should not stop us from hoping he still has more to show us of the girl from the Plaza Hotel.